This example requests two three-stage group sequential designs for normally distributed statistics. Each design uses a power family error spending function with a specified two-sided alternative hypothesis and early stopping only to accept the null hypothesis . The first design uses the BETAOVERLAP=NOADJUST option to derive acceptance boundary values without adjusting for the possible overlapping of the lower and upper boundaries computed from the two corresponding one-sided tests. The second design uses the BETAOVERLAP=ADJUST option to test the overlapping of the boundaries at each interim stage based on the two corresponding one-sided tests and then to set the boundary values at the stage to missing if overlapping occurs at that stage. The "Design Information" table in Output 101.10.1 displays design specifications and the derived statistics for the first design. With the specified alternative reference , the maximum information is derived. The "Boundary Information" table in Output 101.10.2 displays the information level, alternative reference, and boundary values. With a specified alternative reference , the maximum information is derived from the procedure, and the actual information level at each stage is displayed in the table. By default (or equivalently if you specify BOUNDARYSCALE=STDZ), the alternative reference and boundary values are displayed with the standardized Z scale. The alternative reference at stage k is given by , where is the specified alternative reference and is the information level at stage k, . The "Error Spending Information" table in Output 101.10.3 displays the cumulative error spending at each stage for each boundary. With the STOP=ACCEPT option, the design does not stop at interim stages to reject , and the spending at each interim stage is zero. For the power family error spending function with the default parameter , the beta spending at stage 1 is , and the cumulative beta spending at stage 2 is . 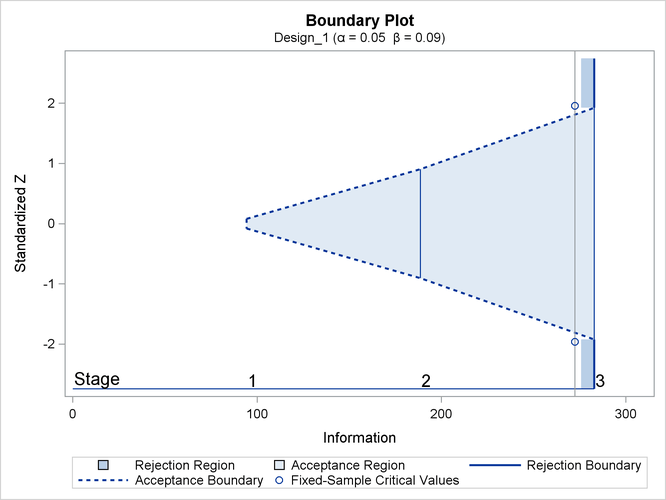 With ODS Graphics enabled, a detailed boundary plot with the acceptance and rejection regions is displayed, as shown in Output 101.10.4. With the BETAOVERLAP=ADJUST option, the procedure first derives the usual boundary values for the two-sided design and then checks for overlapping of the boundaries for the two corresponding one-sided tests at each stage. If this type of overlapping occurs at a particular stage, the boundary values for that stage are set to missing, the spending values at that stage are reset to zero, and the spending values at subsequent stages are adjusted proportionally. where is the upper alternative reference, is the information level at stage 1, and is the spending at stage 1 (as shown in Output 101.10.3). Similarly, the lower boundary value for the corresponding one-sided test is computed as 0.38407. Since the upper boundary value is less than the lower boundary at stage 1, overlapping occurs, and so the boundary values for the two-sided design are set to missing at stage 1.
where is the cumulative spending at stage k before the adjustment, . The "Design Information" table in Output 101.10.5 displays design specifications and derived statistics for the design. The "Boundary Information" table in Output 101.10.6 displays the information levels, alternative references, and boundary values. 0.3333 92.54967 -1.92405 1.92405 . . The "Error Spending Information" table in Output 101.10.7 displays the cumulative error spending at each stage for each boundary. 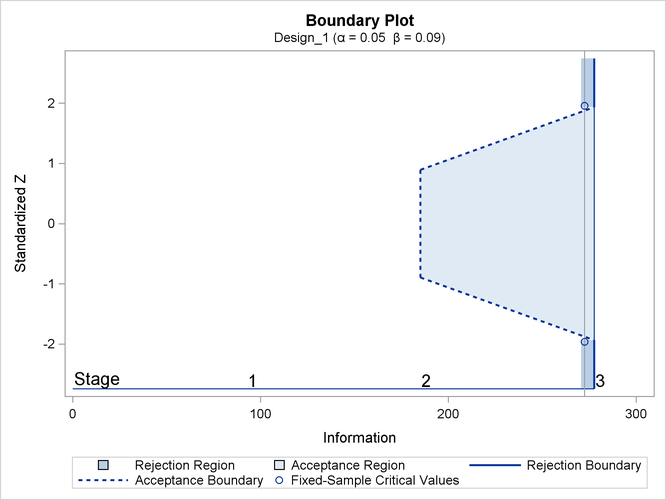 With ODS Graphics enabled, a detailed boundary plot with the acceptance and rejection regions is displayed, as shown in Output 101.10.8.